The assets of this villa are: The serenity in a green nature that offers a sough after tranquillity The large flat and wooded ground that is rare in these regions where there are often terraced grounds The large and beautiful secured pool that will delight children and adults The large common spaces in the villa and its large window bays opening onto the garden and the hills The 2 well-separated bedroom areas that offer tranquillity and privacy. - Luxury marble en suite bathroom (bath/shower, separate shower, washbasin and wall-mounted toilet) with waterfall tap, wardrobe and window - Shower room with lavender blue faience and equipped with shower, washbasin, wardrobes and windows opening onto the garden and the hills. Separate toilet This shower room is adjacent to 2 bedrooms Separate toilet with Provencal yellow faience and window with views over the hill. We stayed here for two weeks at the start of July and all had a fantastic time. We visited lots of the places recommended by the owner and had some great days out. The villa was lovely and in a peaceful setting, it worked perfectly for us as an extended family, there were three children in the group aged from 13 months to 8 years old. The gardens are very secure so it was perfect for them to run around safely. The pool was immaculately kept and a very good size. Bargemon is a very picturesque little village but with everything we needed, we ate at quite a few of the restaurants and all were very good. I would definitely recommend staying here to anyone and would more than happily return in the future. Demeure magnifique ! Dans cette maison tout est grand , le Salon, le jardin, la terrasse mais surtout la magnifique piscine ! La cuisine est très bien équipée , Les chambres sont coquettes et douillettes , les salles de bains sont très jolies, le Salon est immense et très clair grâce à ses baies vitrées qui donnent sur un beau jardin arboré. Le Wifi mais aussi le réseau téléphonique mobile fonctionnent bien dans toute la villa ainsi qu'au bord de la piscine. Côté propreté , c était impeccable ! Nous avons passé un très agréable séjour dans cette villa à la fois élégante et confortable ! Pour notre part , nous y reviendrons ! Je n'ai rien à ajouter !😊 Merci! Vous avoir comme locataire a été un plaisir et nous serions ravis de vous recevoir à nouveau dans notre villa. Nous avons passé deux semaines de vacances quasiment parfaites dans cette belle maison. Tout y est pour se mettre rapidement à l'aise, la maison est spacieuse et bien pensée. D'une propreté exemplaire, certaines chambres ont un caractère très attachant. Le grand jardin offre de la discrétion, et la possibilité de emmener le chien en vacances :-) Piscine superbe, jeux de boules,... Bien situé dans cette belle région, entre la foule de la Cote d'Azur et le calme de la montagne. Vive les vacances!!! Deux semaines superbes dans cette villa d'une propreté remarquable; la piscine est entretenue 2 fois par semaine avec discrétion. La maison est fidèle aux photos, aucune mauvaise surprise. A notre arrivée, nous avons eu un accueil chaleureux pour nous faire visiter la maison. Ici, tout est réuni pour passer de très bonnes vacances avec un climat exceptionnel. Nous avons passé 15 jours très sympathiques dans cette belle villa sur les hauteurs du var. Nous avons beaucoup apprécié la grande piscine sécurisée pour nos enfants en bas âge. Le village de bargemon est charmant nous avons aimé nous y promener et y faire le marché. Je recommande vivement cette location, les propriétaires sont aux petits soins pour les locataires et la villa est jolie et très bien équipée et très fonctionnelle ! Parfait pour 2 couples et 4 enfants !! Tourist attractions, shops, restaurants, swimming spots, sport and cultural activities, etc. You are at the gate of the Verdon Gorge. Cannes’s beaches are 45 min away, the ones of Saint-Tropez are 1 h away and the ones of Fréjus are 35 min from the villa. Strolls from the villa, mountain bike, water sports (Saint-Cassien and Sainte-Croix lakes), St-Andréol golf and thalassotherapy (Fayence) will be available during your holiday. Located in Bargemon (one of the most beautiful villages of France), medieval village with its fountains that are well-known for their excellent drinkable water. Market, all shops, museums, many restaurants, pharmacy, nurses, doctors, local festivals, etc. This one-storey villa which has been renovated in 2010 with beautiful volumes is south-west, north-east and south oriented thanks to openings that are all around the house. 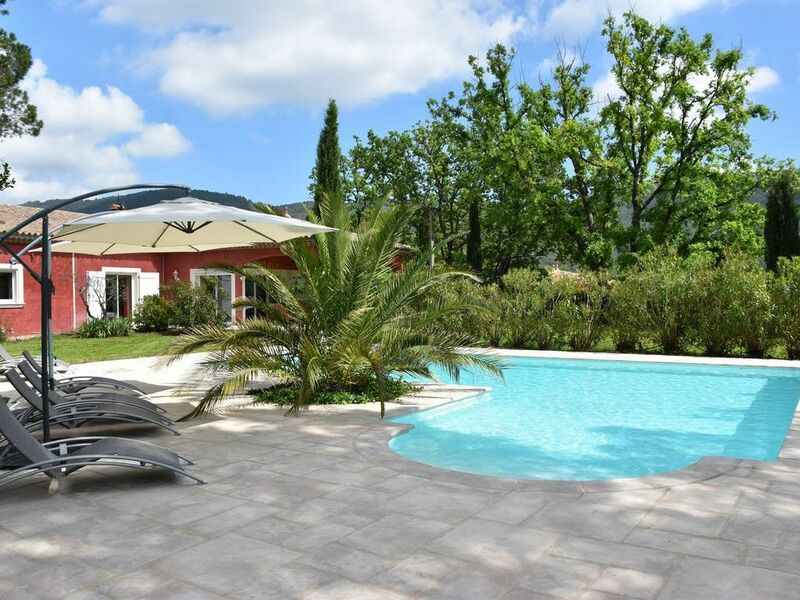 It is built on a 3045 m² fenced ground which is flat and planted with old trees and cypresses from Provence and boasts of a 11x8 m private pool with a large Roman stair. It is not very deep at the beginning with 1 m and deeper at the end with 1.80 m and has stairs all around so you can be in your depth at 1.40 m. Large beaches will delight children and adults. The setting is peaceful and is not noisy at all. The cicadas and the crickets contribute to the enchantment of this charming place that is very appreciated by all its occupants. The rooms are very well distributed with their terraces and south-west and north-east oriented window bays. The large covered terrace is ideal for breakfast, happy hour and all meals but also to relax on the comfortable armchairs or sunbeds with views over the pool and the garden. The pool and its 130 m² deck are bathed in light all day long. The large living/dining room/75 m² open plan kitchen with its large window bays is very pleasant to live in because of its size, its brightness and its outdoor views. Its 140 cm flat screen HD/3D television and its Blu-ray DVD player will offer nice cinematic sessions. There is a luxury fitted kitchen with large window bay opening onto the garden and the hills. The 4 bedrooms are well-separated and bring privacy which is appreciated by everyone. One is equipped with a shower room and a separate toilet and the other has a bathroom (bath with shower head, separate shower, toilet). This villa always makes you want to come back. Le prix de la location s'entend toutes charges comprises (gaz, électricité, eau..., dans la limite du raisonnable). Frais d'entretien (piscine, ménage fin de séjour, avec linge de maison (draps de lit et torchons) : 200 € (à payer sur place en espèces). Linge de toilette + drap de bain : 20 €/Personne/Séjour. Une caution de 1 300,00 euros sera versée à l'arrivée à la remise des clés. Cette caution sera intégralement remboursé lors du départ si l'état des lieux est correct. Les arrivées en juillet et août sont uniquement le samedi. Annulation : pas de remboursement.